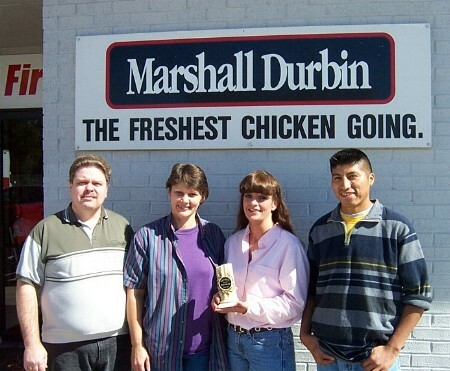 Dale Jones (2nd Processing Superintendent), Debra Bruner (Fast Food #1 Supervisor), Debra Dill (HACCP/QA Manager) and Rumaldo Ramirez (marination mixer) proudly display the plant's KFC award. 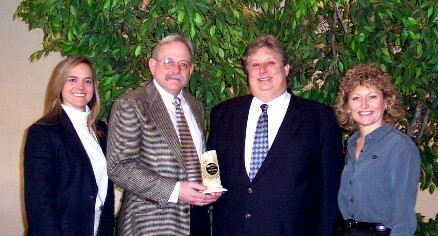 Earlier in the year, the Jasper processing plant was recognized by KFC/Yum! Brands, Inc. for their work recently during a special trial for KFC. The trial involved a good bit of "hands-on" and special testing that had the plant working closely with KFC. Director of Processing Todd Ormon praised all of the employees that were involved in the trial. "I would like to thank all of the employees for their extra effort during this test period for KFC. Their hard work was recognized by KFC and will help strengthen our relationship." Thomas Roberts and James Faison, Marshall Durbin's Director of Science and Quality Assurance.